A showroom for wedding and evening gowns--designed as a metaphor of the prelude to a wedding or gala event. A silent space where for a moment gowns takes center stage, framed walls floating above the light concrete floor, aligned expanses of mirror, and luminescent milk glass panels that gently touch the ceiling set the backdrop for envisioning the event. Simple in plan, the space is defined by architectural moments and components -- the entry door “cathedral-like” at 12 feet with a seven-foot handle in brushed stainless marks the entry. 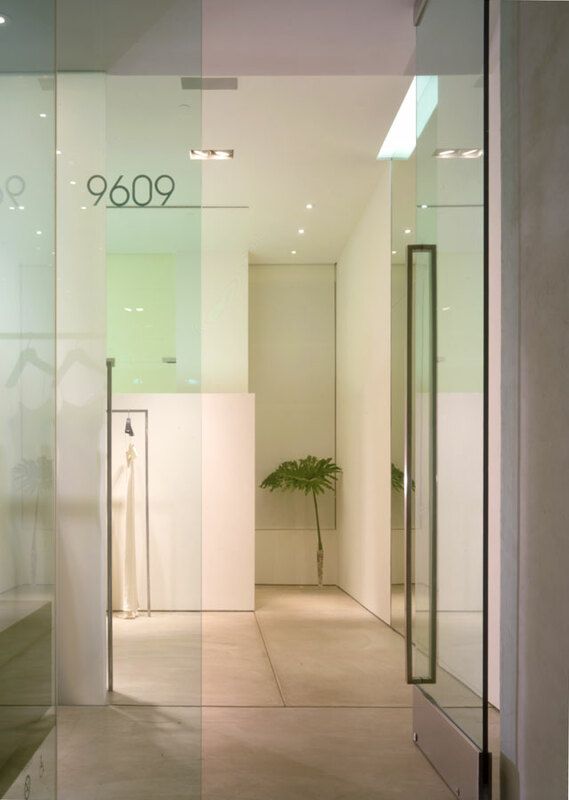 A singular recessed well light cast within the exterior entry slab provides a pin-point like focus as one enters the boutique. The primary wall runs along the length of the store while projecting light toward the ceiling from a continuous recessed fixture at its crown. Gowns are suspended against this wall on a single square brushed stainless steel fixture that spans 30 feet in length. At the opposite end floats a 14-foot tall recessed mirror, where family and friends can lounge, awaiting the woman of honor to model the dress. In the private dressing rooms a degree of human warmth and scale is created through, pendant lamps hanging eight feet from the floor and natural sea grass recessed into the slab.